We’ve spiced things up a bit with our Baja Buffalo Chicken Wings recipe. 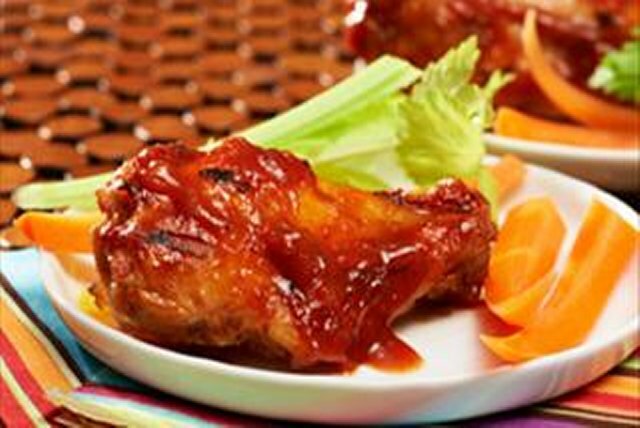 Flavoured with a double hit of chipotle peppers, these oven-baked chicken wings are sure to turn up the heat. Combine first 5 ingredients; pour over chicken in shallow dish. Turn to evenly coat both sides of each wing piece. Refrigerate 30 min. to marinate. Heat barbecue to medium heat. Remove chicken from marinade; discard marinade. Grill chicken 19 to 20 min. or until done, turning occasionally and brushing with barbecue sauce for the last 10 min. Place chicken on platter; top with onions. Combine all ingredients except chicken wings and onions. Marinate chicken as directed. Heat oven to 450ºF. Remove chicken from marinade; discard marinade. Place chicken in single layer on foil-covered rimmed baking sheet. Bake 15 min. or until chicken is done. Place chicken on platter; top with onions. Prepare recipe as directed, except omit the tequila.